Make yourself comfortable at Home2 Suites by Hilton Bloomington IN. Our all-suites extended stay hotel provides a great location for exploring all that Bloomington IN has to offer. We*re close to Indiana University local businesses restaurants parks and retail options and are within walking distance to Memorial Stadium - Assembly Hall. Enjoy spacious pet-friendly suites at our welcoming Bloomington hotel. Each suite offers free Wifi and free breakfast a comfortable sleeper sofa and a stylish functional kitchen area. Relax on the cozy Serta Suite Dreams Bed or get work done in the flexible work area. Our modern eco-friendly hotel is proud to offer sustainability and green initiatives. Enjoy our free Inspired Table breakfast with over 400 mix and match options. If you forget something or fancy a drink or snack the Home2 MKT is available 24 hours a day with food drinks and other essential items. 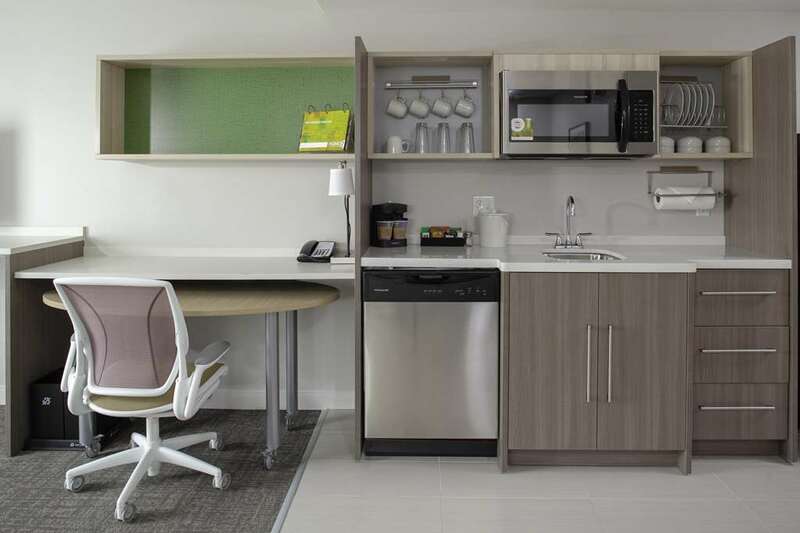 You*ll love the amenities at our Home2 Suites Bloomington Hotel. Relax on one of two outdoor patios take a dip in the heated saline pool or work out in our fitness center. Get work done in the business center or run a load of laundry at our onsite laundry facility. Scotty*s Brewhouse: Casual sports bar chain serving bottled - own-label beers cocktails - comfort food. Le Petit Cafe: A Bloomington classic simple francophone cuisine prepared home style and with an absence of pretension. A small daily rotating menu based on current market availability. Malibu Grill: Seafood steaks - pasta served with local beers - craft cocktails in a laid-back yet stylish bistro. The Owlery Restaurant: Chill arty choice featuring original vegetarian fare - craft beer plus creative vegan baked goods. Upland Brewing Company: Contemporary pub grub accompanies rotating house brews in a comfy art-lined space with a patio.